Pro Model Starter Kit - Dino Rentos Studios, INC. Choose any SINGLE tool from the Sculpting Tool, Engraving Tool, Freehand Router, or Hot Knife. Plug it into the variable Pro Power Station and start cutting! 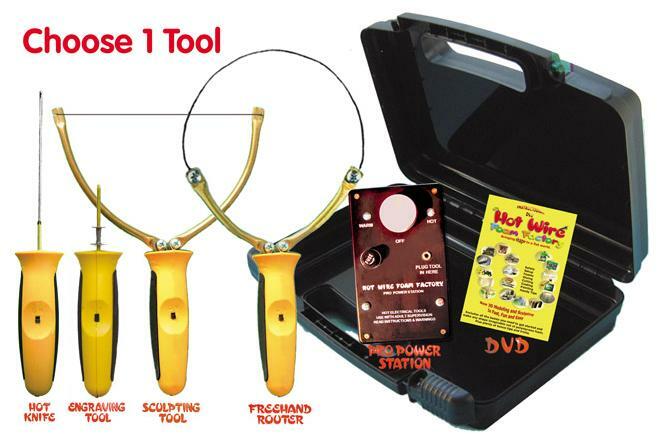 Comes with the Variable Pro Power Station, 6 spare wires for the Sculpting Tool (heavier than the wires used with the AC powered model), 4 blades for the Freehand Router, and the 90 minute Hot Wire Foam Factory Instructional DVD. Packaged in a sturdy black toolbox large enough to accommodate all the pro tools and accessories.